Sweater weather isn’t just a time of the year, it’s an obsession. I love feeling the first signs of bite in the air, because I know it’s time to bust out my favorite sweaters, giving me a reason to be comfy and warm all day ” and stylish, of course! 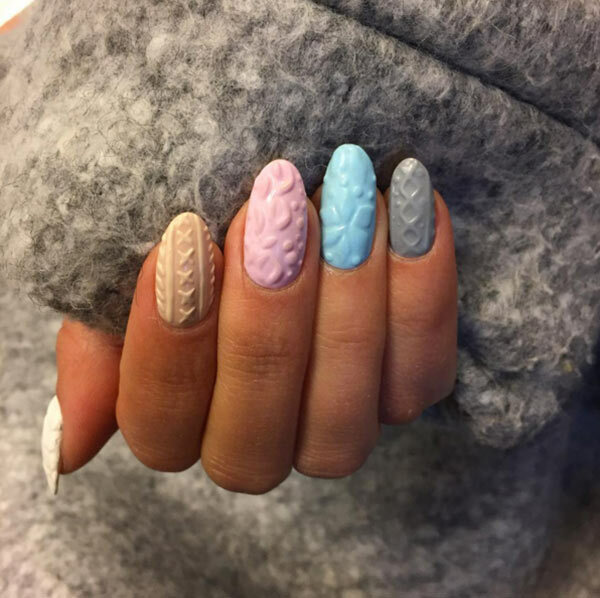 I know I’m not alone with that thought, especially not with the interesting new cable knit sweater nail art trend that is surfacing now. 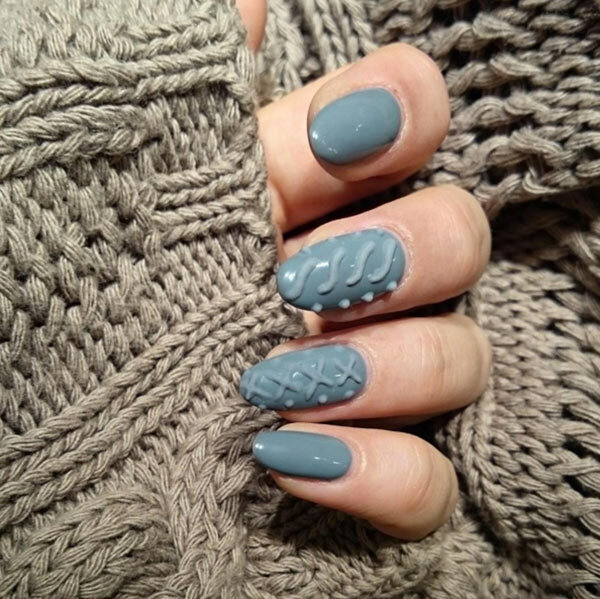 Cable knit sweaters are a must for winter, and now trendsetters have shown the possibilities of mimicking the pattern on your nails. 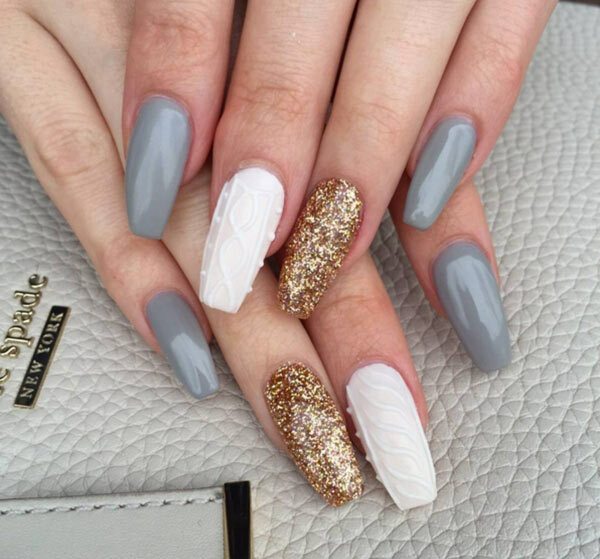 This is one of the year’s newest nail trends, and it’s taking the world by storm. 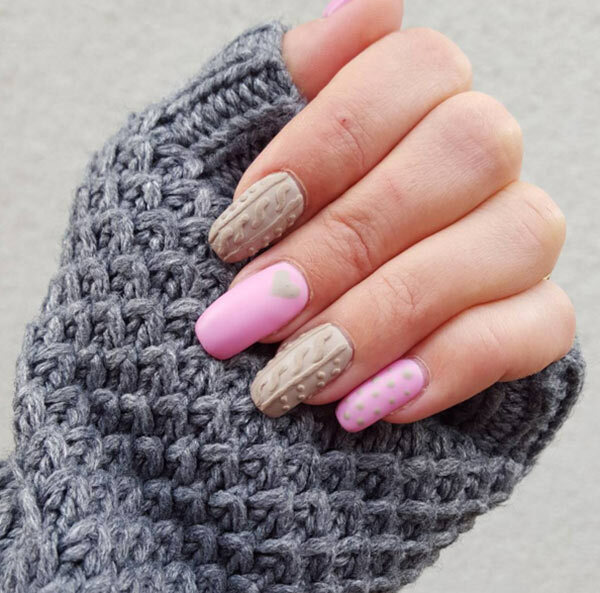 Many who have tried the cable knit sweater nail trend so far have used the texture on one finger per hand, to really highlight the design, and to distract the eye with a difference of color. But, of course, you can do whatever you like! 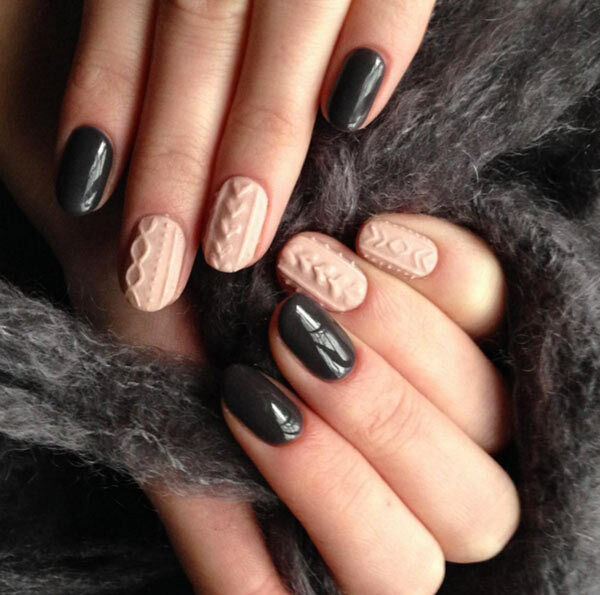 Others have used different patterns and colors on each nail, which has an eye-catching effect. You can create the overall pattern with gel polish, and then the texture with a dotting tool. This is a great trend, especially for those with deft hands and polishing skills. Since gel polish is so easy to mess up, particularly on your own hands, this is a task you may not be able to pull off on your own. I know I wouldn’t be able to create such a precise pattern! If you have a friend who does exceptional nail work, this could be a great project to spend a cold night in. 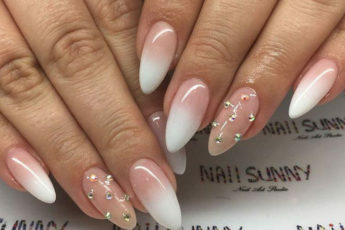 Why not make a fun night of it, by ordering food, watching a movie, spending time with your friends, and leaving the evening with fabulous nails as a result. 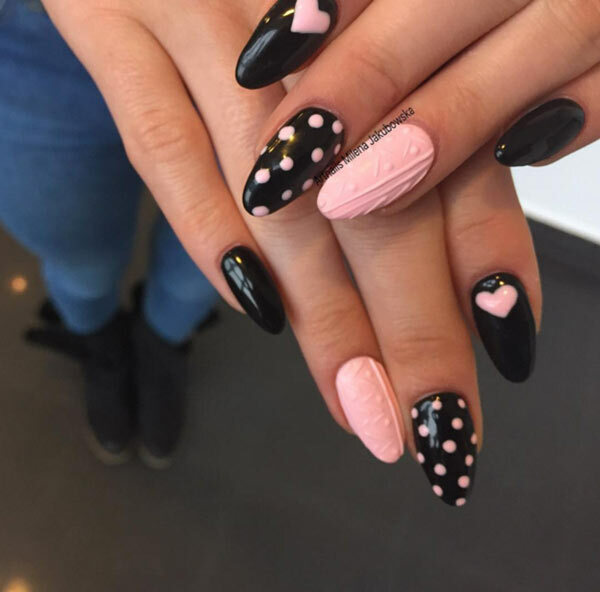 If you’re not so lucky to know someone with nail painting expertise, however, you can plan a fun day out, perhaps with your friends, and visit a nail salon to try out this trend. 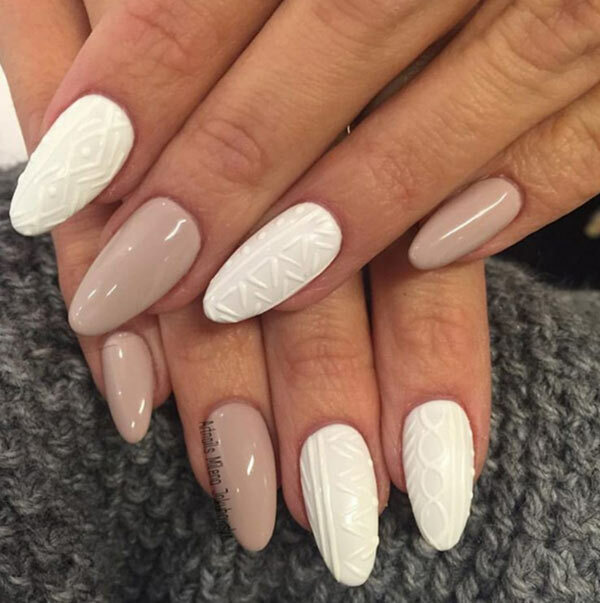 Either way, you’re being treated to a wonderful time, and you’ll have your amazing nails to remind you of that. If you’re not as much of a fan of the textured knit nail art trend, there are other holiday-related themes you may wish to try out. Instead of dealing with the texture, maybe you’d like to try using a classic Christmas sweater pattern. This work requires smaller work, since you’ll be recreating a pattern on a canvas as small as your nails, so this design idea in particular would be better off left to professionals. Regardless of difficultly, it’s fun to imagine what your favorite Christmas sweater designs would look like in a smaller pattern on your nails. Another suggestion to accompany this trend is the incorporation of sequins. 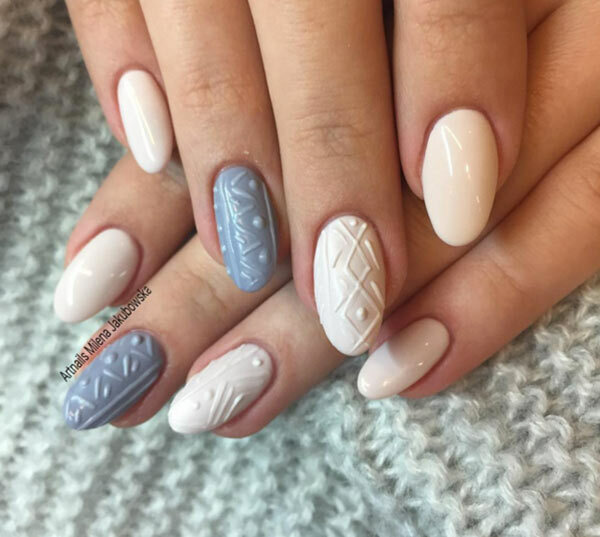 If you use them in just the right way, you have an elegant design on your nails, which will work perfectly with the often-worn pastels and metallics of winter. This look is especially successful if worn dressed-up, and can work as an accessory of its own. 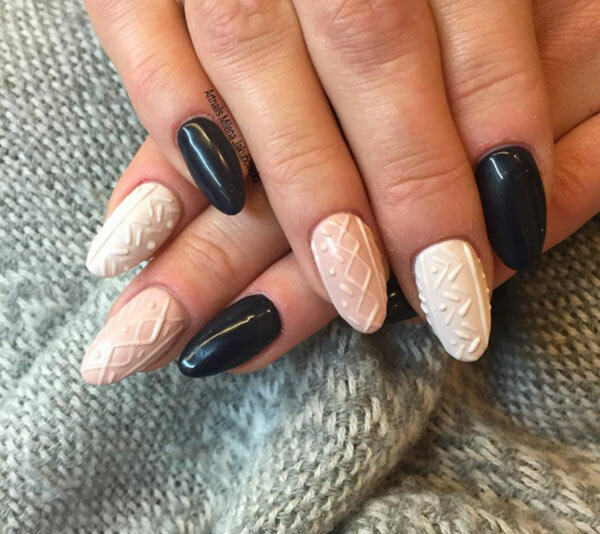 Regardless of which designs you choose to adorn yourself with, cable knit sweater nails will be great conversation-starters for the coming holiday season. It will work especially well with all of the holiday parties you may be attending, with friends or with family.